Before long, millions of children in the MENA will be adults striving to build their lives in a region beset by poverty, political instability, and inequality. What do these young people need to navigate these challenges and become strong, determined individuals who can change the face of the region? They need faith. They need healthy, inclusive values. They need hope, and the knowledge that they are not alone – that they are always supported by their Heavenly Father. Communicating God’s love to these children is the very heart of SAT-7 KIDS. And, the team has learned, there is no better way to do this than by giving a voice to Christian youngsters who understand the issues their peers are facing. Enter Joyce (12), Keyanna (13), and Joy (19), Presenters of the live teaching and worship program A Riddle and a Story. Every week, their show broadcasts Bible stories, songs, and life lessons into the homes and hearts of millions of children. 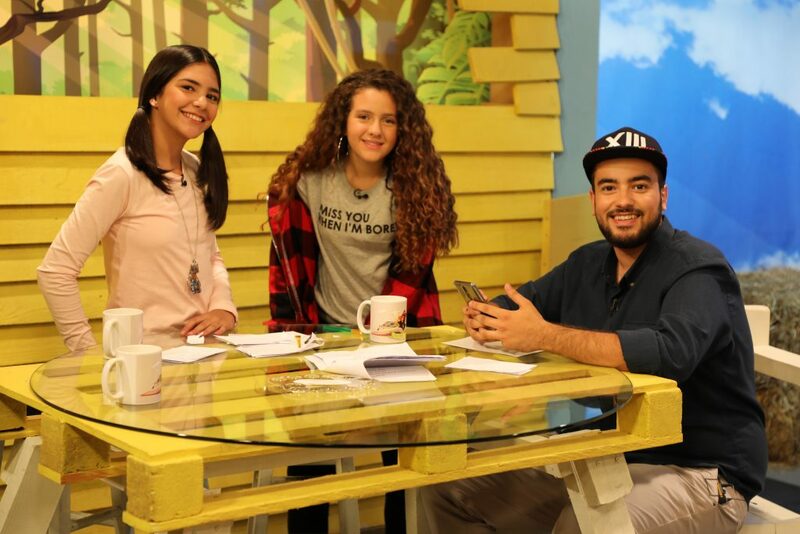 Children can call in live to the program and talk with the young Presenters, share their own stories, and seek advice. From left to right: Keyana, Joyce and Joy. The three Presenters answer calls and read viewers’ messages on air. The alternative – idolising secular celebrities who may present unhealthy values – will not help children grow. “We want to give our young viewers good role models to look up to,” Marianne says. When asked what their own dreams are, the Presenters’ answer is unanimous: for God to use them and their talents to help more people, and for their program to help children grow closer to Jesus.